With the close of the FY2019 Form 471 filing window in March, applicants are answering Program Integrity Assurance (PIA) questions in hopes of a timely funding commitment decision letter to begin service July 1, 2019. Applicants are encouraged to carefully answer PIA questions in a timely manner, and to verify the accuracy of their application(s). After a funding commitment decision is issued, any discrepancies will likely require the submission of an appeal to correct. Funding commitment decision letters (FCDLs) represent the highest percentage of USAC actions for which an applicant submits a letter of appeal. 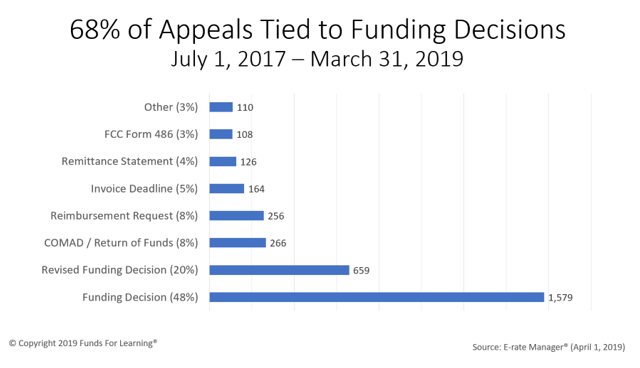 Together, FCDLs and revised funding decision letters (RFCDL) represent over 68% of all appeals submitted to USAC between July 1, 2017 and March 31, 2019. Appeals must be submitted to USAC within 60 days of any grievance. Appeals to USAC are submitted through the online EPC portal. EPC data identifies 538 current appeals pending review with USAC. This count represents approximately 461 different applicants, of all sizes and applicant types, across 49 states and territories. 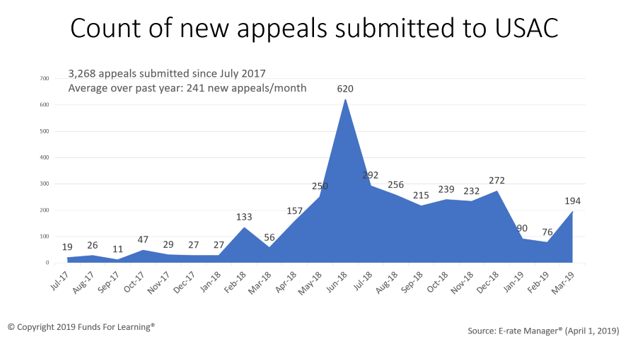 The average wait time of the current pending appeals is approximately 144 days (4.8 months). Applicants are encouraged to question 471 application discrepancies and to contact USAC program integrity reviewers during the review process to avoid delays in funding or an inaccurate commitment decision. Denials can be appealed; unfortunately, these delays, even when corrected later, lead to delayed deployment and service delivery for applicants. 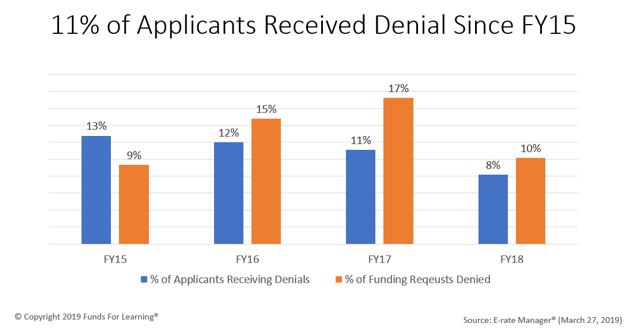 Since the E-rate modernization order began in funding year 2015, an average of 11% of applicants have received some type of denial each funding year.